A factor that adds to the appeal is to see a woman at the centre of a survival story. Shailene Woodley as Tami Oldham is terrific in this film based on Oldham’s incredible life story. Adrift is a two-tiered throwback , a stirring and at times gruelling portrait of survival, and an old-fashioned showcase for Woodley. Soon after the beginning , we are thrown below deck in the aftermath of a brutal Pacific Ocean storm as Tami comes to in a sinking yacht, bleeding from a head injury, struggling to survive. We so often see female characters relegated to worried wives and mothers waiting for a call that it is downright refreshing to witness the depiction of a woman as independently strong, capable and determined to survive. The dual narrative structure is what gives the film its momentum. Beginning with the aftermath of the hurricane that left Tami stranded the film flashes back to her meeting Richard (Sam Claflin), her partner on the journey. It creates an element of suspense about the moment when the crisis happened, as well as the prospect of being rescued. The momentum also helps in turning the film into a reasonably effective love story, with the free-spirited Tami landing in Tahiti and being wooed by Richard, who fatefully agrees to sail a wealthy couple's boat to California for them. The relationship is at the core of the story, it is what brought Tami to this place, and it is what keeps them alive. Some of the key scenes are harrowing but the shifts in time help break up what could easily have become claustrophobic. Since it is a two-character piece, there's considerable pressure on Woodley and Claflin, and they deliver admirably. The actress, in particular, continues to demonstrate her versatility after the Divergent series and HBO's Big Little Lies. It helps that Woodley’s performance is so lacking in vanity throughout; she’s the kind of actor who’s completely uninhibited orgasmically devouring fingerfuls of salvaged peanut butter, and whose face you long to see crack into ugly-crying bliss at the sight of land on the horizon. Director Baltasar Kormakur, who has given us Everest, earlier showcases his experience of the man-(or woman)-against-nature genre. The shoot was done mostly in Fiji which adds a sense of authenticity to the ordeal. Kormakur doesn’t sugarcoat what it is to get shipwrecked , though the film skimps on the arduous and miserable details of the 41 days adrift going back and forth between the past and present. 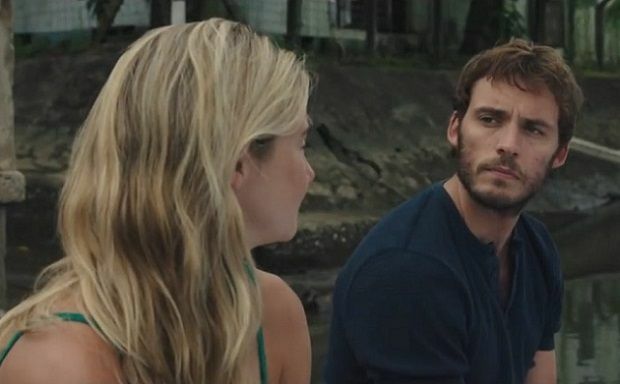 This is Tami’s movie without a doubt; Richard is more of a good-looking dreamboat, warmly inhabited by Claflin but nowhere near as rich a character. Since Adrift is based on a true story, it doesn’t work if you happen to know anything about the true story. So, the less Googling done before going for the film, the better. The movie is a boilerplate piece of survival drama, but Woodley makes it more emotionally satisfying than it would be otherwise. Just watching her will to survive is a profound thing to see on screen.